This is another chapter in my ongoing series about what you should be looking for as you assemble a collection of vintage jewelry. In past chapters we have talked about condition, metal backs, types of stone settings, types of stones used, pin clasps, earring backs, etc. Today's chapter will talk about the various types of dress clips, fur clips and shoe used during the popular early periods in vintage jewelry manufacture. While modern day sellers often use the term dress clip and fur clip interchangeably, there are definite differences in the design and intended use of them. Dress clips have a larger and wider piece of metal which has "teeth" intended to grasp thin material like a dress or shirt. There are many styles of dress clips. Some were flat hinged pieces of metal with no decoration and others were ornately filigreed in design. Occasionally, one would be more of a wired frame design. Normally, a patent number is found on the underneath part of the hinge mechanism. There are numerous bakelite dress clips from this period too. Most early vintage jewelry manufacturers made dress and fur clips, but Coro and Trifari are two notable ones. Many of these clips were patented, but not all were. Some additional designers who made dress and fur clips in number are Miriam Haskell, Eisenberg, Hobé, Hattie Carnegie, Nettie Rosenstein, and Polcini, among others. 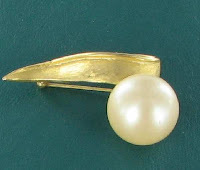 A special type of clip in this category is a pair of clips which has a special mechanism which allowed two brooches to be worn as a single pin. Coro and Trifari are famous for these double pins. Coro called theirs "Duettes" and Trifari named their creations "Clip-Mates." There are many other manufacturers of these double clips - many were European in design. The following photos show a common design mechanism for the combination pins. The first two photos show a Coro duette both closed and open and the third photo shows the Trifari Clip Mate. 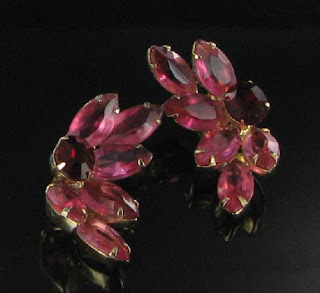 Be sure to visit my Vintage Jewelry Lane Site. I have a nice range of shoe clips and dress clips for sale at reasonable prices. Be sure to check back soon for the last installment in this series. I'll cover how to shop for vintage jewelry, how to value it, and how to purchase for a good price. I'll also give some tips for buying online and tell you about extras that add value to a piece. Renoir was a California Jewelry Company who manufactured between 1946 and 1964. They specialized in solid copper jewelry featuring the Arts and Crafts style. Their pieces are distinctive with superior designs and of very high quality. Matisse was a subsidiary company which was establised in 1952 - often using copper with colorful enamel. Matisse Renoir pieces are highly collectible and much sought after. I have recently aquired a wonderful Matisse Renoir Demi parure from the series called "California Dreaming." The name is so apt. Imagine yourself sunning on a beach in Surfside with fluffy power puff clouds floating overhead as the sun beats down on the surf and sand. The fine grains of the sand around you glisten in the morning sun and pick up the colors which abound. This visual image describes my set beautifully. 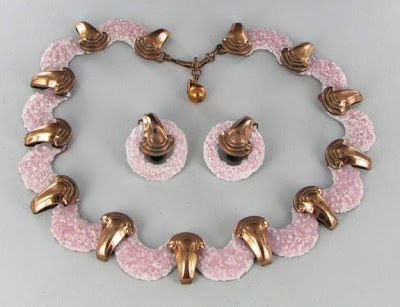 All of the pieces feature tiny bits of fused glass and enamel in a power pink color baked onto a copper background. The necklace is 16" long tip to tip and 7/8" wide and the earrings are 1" wide and have clip backs. These are book pieces featured in the Book "Copper Art Jewelry," by Matthew L. Burkholz and Linda Lichtenberg Kaplan. The book makes note of the fact that very few of these sets remain in good condition, since they were not as durable as the kiln-hardened enamel work for which Matisse Renoir is so famous. My set is in wonderful condition and would make a great addition to your Matisse Renoir copper collection. 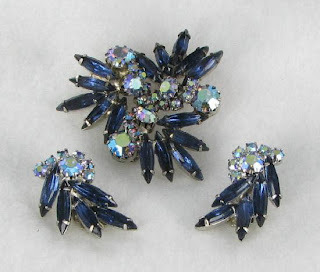 The California Dreaming Set is available from my Vintage Jewelry Lane set for $179.99. You can view close up pictures and more details of the set on the site. 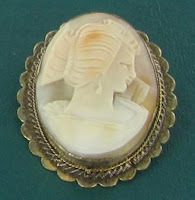 Vintage Jewelry Designers - Who am I? For more information and the answer to today's riddle, you can go to the designer page of the resource library on my website Vintage Jewelry Lane. (answer is also shown reading backwards at the bottom of this blog post.) All three of these pieces are for sale on my main site Vintage Jewelry Lane. I'll be doing more of these riddles over the next weeks and months. Have fun with the series. This blog post is another in my series about choosing jewelry suitable for individual star signs. Pisces is the star sign for those born between February 20 and March 20. Those born under the sign of Pisces are said to be compassionate, devoted and imaginative. On the negative side they can be seen to be a bit oversensitive, indecisive and somewhat of an escapist. Combining these ideas gives me lots of possibilites for choices for a jewelry gift for your Piscean friend. 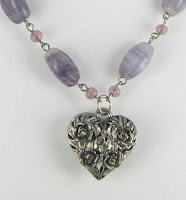 How about this lovely purple banded glass stone in lovely amethyst colors with a pretty filigree heart pendant? It is available in my Carolina Collections Vintage Jewelry store for only $10.75. Since Pisces loves the water, you couldn't go wrong with any seaside themed jewelry. Does she like vintage sweater guards? Look at this sweet seahorse sweater guard with creamy faux pearls and cute little seahorses on either end. 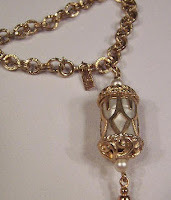 It's available in my Vintage Jewelry Mall store for only $12.99 and is just adorable. Check back soon for the next chapter in this series, when I will discuss jewelry ideas for your Aries friend. There are many styles of mosaic jewelry. One that I particularly like is called Pietra Dura. In this type of design, which is similar to Micro Mosaics, the tessarae or tiles are much larger and are made from hard stones such as chalcedony, jasper, lapis lazuli, and other nice stones. These large tiles are then set into a solid back ground such as sandstone or black marble for a pictoral effect. The surface of the design is flush with no protruding tiles or grooves between the tiles. Floral scenes are the most common, but any design can be used, such as butterflies, human figures, birds and architectural buildings. The settings are generally silver or genuine gold, but plated settings and brass are also used. Most settings are open backed to show the back of the background stone used. The popularity of Pietra dura pieces dates from the early to mid 1800s. This type of souvenir jewelry is known as "Archeological Jewelry." Mosaic jewelry of all kind became fairly widely available after the excavations of Herculaneum and Pompeii. Pietra Dura jewelry was found in Italy - especially Florence, but was also available around the same time in England and other European areas. I've also seen some examples of it in pieces from Taxco Mexico. This type of mosaic jewelry is highly collectible and fuels much of the tourist trade today in Italy. Be sure to visit my website Vintage Jewelry Lane. 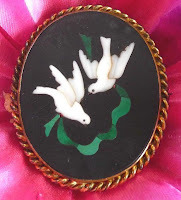 I have a large range of mosaic jewelry, including some of the Pietra Dura pieces shown in this article. My Juliana Demi Parure and Earrings are Verified! Those of you who follow my blog know that I often submit jewelry pieces that I believe may be DeLizza & Elster Juliana designs. Juliana Jewelry was not marked on the pieces. They only had paper hang tags which were often discarded. I recently submitted four pieces - a parure and three pairs of earrings. Two of the earring pairs are still in the verification process, but the demi parure and one pair of earrings have been verified. I am delighted, to say the least. The demi features a stunning combination of dark blue navette rhinestones and meridian blue aurora borealis stones. All prong set with open backs in a silvertone setting. It is to die for - particularly since I adore blue jewelry, which is my favorite color. The earrings are no less impressive. They feature interesting hand painted milk glass stones and tabac aurora borealis rhinestones in a goldtone setting. Very layered design with open back settings which are typical of the Juliana design. 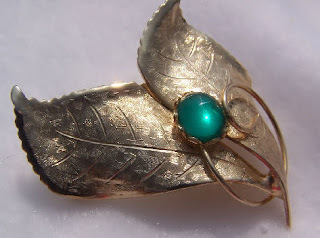 You can view the two verified Juliana jewelry items on my Vintage Jewelry Lane website. The set is $125.99 and the earrings are $45.99. If you would like to view the verification page for the two pieces, the D & E Juliana earrings are on this page - (#63 and #64), and the D & E Juliana rhinestone set is featured here - (#196 and #197). Let's hope I have as much luck with my other two pairs of earrings. Fingers crossed! As readers of my blog know, I love glass jewelry. I believe it is the most undervalued style of vintage jewelry on the market. I adore the coldness and weight of it when worn, and it withstands the test of time when compared to vintage plastics. I also love cha cha bracelets. They are so funky and make such a statement when worn. 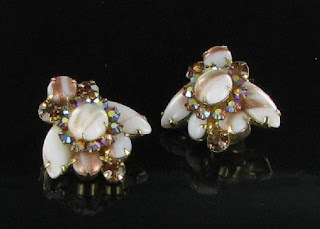 I have just listed a fabulous set on my Vintage Jewelry Lane website which incorporates both. 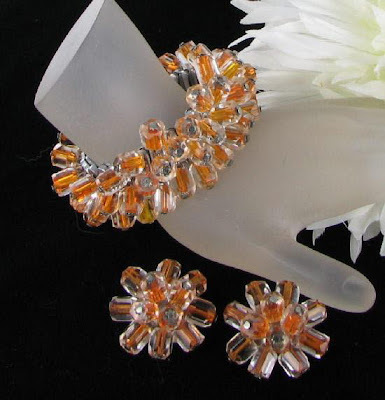 It features unique orange and yellow faceted glass beads in a cha cha bracelet and matching earrings combination. The bracelet is an expansion style, so it should fit most wrist sizes. And the colors! Yellow and orange are THE colors for spring according to the fashionistas. This set will be right in style, even though it was made in the middle of the last century in Japan. All pieces are marked with the Japan Hallmark. You can see the cha cha bracelet and earring set on my site. It is available for $85.99. But hurry - I only have one set. Juliana Jewelry - Verifications are in! In a later blog post, I will be doing an article about Juliana Jewelry - one of the most collectible designer brands of vintage jewelry. The problem with Juliana is that the pieces were never hallmarked - they only had paper tags which were often discarded. If you look on ebay, you will find hundreds of pieces of jewelry described every day, for sale as authentic Juliana, which are not genuinely those of this designer. So what is a collector to do? There is a wonderful site which accepts photo submissions of pictures of pieces that the sender wants to verify. The site them submits them to Mr. DeLizza, who was one of the original founders of DeLizza and Elster who made Juliana Jewelry. Mr Delizza either verifies or denies the authenticity of the piece. Each verification process is done in an album, and then the results are announced. Last month I submitted these earrings for verification. They have many of the Juliana design techniques, so I was hopeful they were genuine. I will never list an item as Juliana unless it has been verified, or unless it has the design techniques which make it unmistakably Juliana. 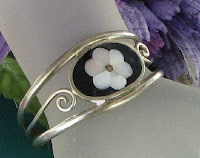 I find some jewelry types easy to identify - some types of bracelets and earrings are had to miss. But, I find that earrings are very hard to identify, so I recently submitted a pair for verification. Alas - they were not. The latest verification page is in - you will find Juliana Verification album 13 here. My earrings are #55 and are labeled as not D & E. Never fear though - I have four more pieces, including three pairs of earrings and a set that I am going to submit soon. The site asks that you do research about Juliana before you submit an item for verification. There are some specific design techniques that should be part of the piece submitted. I'll go into all these later and will also give you the submission procedure at that time. In the meantime, enjoy the verified pieces in the album 13. You will be able to see why Juliana jewelry is so desireable and highly collectible. The news of the economy is front page lately. It seems that this is all the newspapers and news media outlets are discussing. No business appears to be immune to the fallout of the recession - and jewelry businesses have not escaped. One company which has caught my attention is the Colibri Group, which also markets under the name of Bolan Bullock, Seth Thomas and Krementz. (Krementz is a well known vintage jewelry design mark, and well respected. Colibri has been ordered to sell all assets by mid June this year. The company, based in Rhode Island is one of the leading suppliers of independent and chain jewelers. It suddently closed on January 14 this year, citing "current economic conditions." Also, a US court has ordered the liquidation of the Christian Bernard Jewelry Chain. The company abruptly closed its fifteen store and filed for bankruptcy on December 26 last year. It has recently reopened its stores as part of the liquidation process, so that the assets can be sold. Christian Bernard stores are located throughout the Eastern US. It will be interesting to follow the news of other jewelry suppliers and chains as the recession takes hold of our country. I think it is fun to read my horoscope and sites that talk about astrology and the Zodiac signs. I thought it would be kind of neat to do a series about jewelry choices for each of the zodiac signs. Since it is February, the Zodiac sign that I'll discuss is Aquarius - those born between January 20 and February 18. Those born under the sign of Aquarius are said to be friendly by nature, independent thinkers with original and creative thoughts. They are highly inventive and often humanitarian. On the negative side, they are thought to be somewhat rebellious and eccentric and can be a bit unpredictable and stubborn. If you have an Aquarian friend, you might find her adventurous with a sensitive nature, so that her feelings get easily hurt. Combining some of these ideas gives me lots of possibilities to suggest for jewelry for an Aquarian. 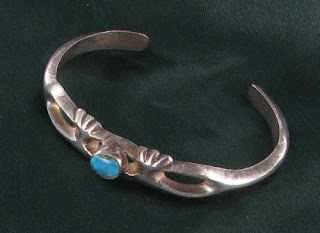 How about Native American Jewelry? The designs often include imitation or genuine turquoise stones with sterling silver, and the colors blue and green both fit into this idea - turquoise comes in both the traditional color and also green turquoise. How can you use the numbers to help you make a jewelry choice? Necklaces with more than one row would do the trick. How about selecting a blue or green multi strand necklace? If you choose one with four or eight rows of beads, you would make her a very lucky gal. 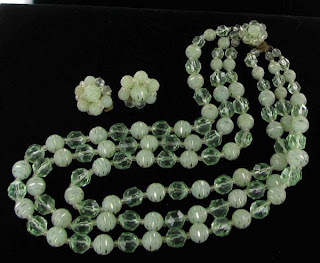 This pretty set from West Germany has the loveliest pastel green beads and matching earrings. Amethyst and garnet jewelry is plentiful, but can be expensive. What about purple or blood red rhinestone jewelry for the same look but at a fraction of the price? 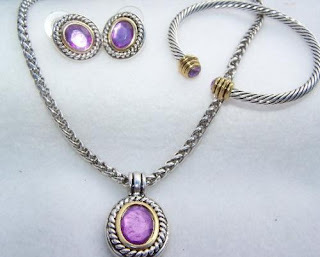 This lovely parure features amethyst colors and is so reasonably priced at only $13.50 for all three pieces. 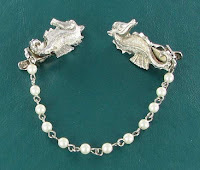 Be sure to check back soon, when I will discuss jewelry possibilities for those born under the sign of Pisces. As promised, I am continuing my ongoing series about what you should be looking for and understanding as you put together a collection of vintage costume jewelry. In the last chapter, we talked about necklace and bracelet clasps used. Today, I will talk about clasps used on brooches. It is easier to date some vintage and antique brooches, compared to other types of vintage jewelry, by inspecting the clasps used. This is because some clasps were used on much older pieces, and the date of introduction of some of the newer clasps is definite. There are many varieties of clasps used on vintage brooches - C Clasps, Trombone or tube clasps, Safety pin clasps, Early safety clasps, and modified C Clasps. 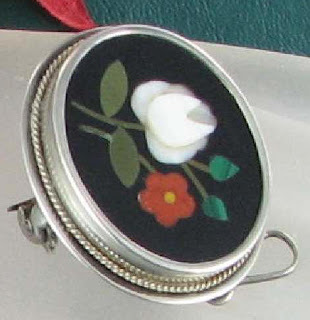 The C Clasps are the earliest type of clasps used on brooches, although a modified version of them can be found on newer pieces. Early C Clasps were used in the mid to late 19th century until the very early 20th century. The looked just as the name indicates - like a C. Some were just a curved wire which held the pin, and others were a more flattened wider C. In both cases the pin part of the clasp slid under the C and held the brooch in place. Early locking safety clasps consisted of a C clasp surrounded by a swivel top which was compact and rounded. These safety clasps look quite different from the modern locking C clasps and were routinely used on Art Deco and Art Nouveau pieces in the early part of the 20th century through the middle of the last century. They were patented in 1901. Trombone or push tube clasps consisted of a barrel shaped on one side of the clasp into which the pin was inserted. The tube moved from left to right for insertion and then slid back to hold tightly. Patented in 1850, they were routinely used in Europe until the mid 1950s. Safety pin clasps were just that. Small safety pins, either as part of the metal, or embedded in lightweight wood or vintage plastics. Cheaper versions of them are still used, but the most common vintage ones that I have seen are on micro mosaic jewelry and wooden Artist signed Russian pins. Finally, the modern locking safety clasp was used. You will find it on jewelry from the 1920s until the present day. The construction of it is similar to the early safety clasp, but it has a more "separate" design in the swivel part of the clasp. There are a number of designs of this safety clasp. It has a swivel locking piece over the C, but isn't as compact as the earlier version. While the pin clasp can be used to give an idea of the age of the piece, once again, it needs to be used in conjunction with other design techniques to give a definitive date of manufacture. I will examine earring backs in the next chapter of this series. Please check back soon. My main interest is vintage jewelry, but occasionally a contemporary designer catches my eye because the quality of the work is so wonderful. The latest designer to take my fancy is Judith Ripka. Judith was born and raised in New York. She says her earliest memories are of "playing in her mother's jewelry box and accessorizing her clothing by tying a heart charm to her belt, hanging a pin of a chain or transforming a necklace into a belt and weaving it through the belt-loops of her jeans." She studied design at Parson's School of Design and launched her first 18K gold collection in 1977. She has a wonderful organic eye for design and her pieces show that she understands that fashion is about style and creating a total look. The Ripka collections feature both 18K Gold Couture pieces and Silver and Gold pieces. Her jewelry is often seen on the red carpet worn by celebrities and is found in high end stores and boutiques. 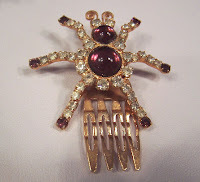 I have been lucky enough to purchase two pieces of Judith Ripka jewelry for my Vintage Jewelry Lane Site. Both are made of sterling silver, and diamonique stones. 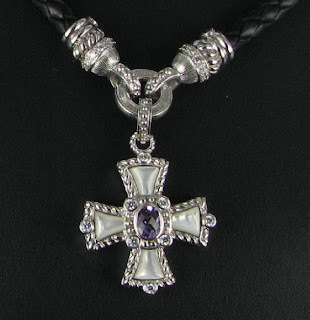 The first one is the fanstastic Judith Ripka Maltese Cross Enhancer pendant necklace pictured above. It is available for $325.00. It is just stunning and features mother of pearl inlay and an oval amethyst center stone. The other is a set of glass pearls with a diamonique heart enhancer pictured below. This stunning necklace is also set in sterling silver. The pearls come in the original presentation box too! 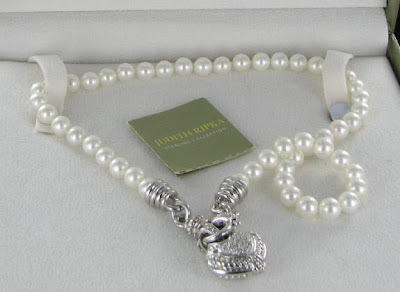 This lovely Judith Ripka pearl necklace is available for $350.